My husband and I have just celebrated 28 years of marriage and are business partners as well. We have had a fairytale relationship and are mad about each other. We share all the likes that couples do, renovating old homes and visiting the parks in Orlando. Our annual trip to Disney World, at first was just the two of us, then three, and finally four of us from our home in New Jersey as our family grew. My husband always got worried every time we finished renovating a place because he knew my eyes would start wandering again. About 8 years ago, we had just finished an entire renovation on an old, 1928 English Tudor House and gardens. We entered a contest, winning an honorable mention in Better Homes and Garden’s Whole House Redo. So instead of waiting until our traditional December trip to Florida, we decided it was time to have an early fall trip to Florida. That year, while driving on the return trip from a wonderful Halloween visit to Orlando with our boys, we were just a few hour North over the Florida border, when snow flakes started to fall and the air got down to a chilly 40 degrees. Looking at my husband who was driving, we both said to each other “turn around.” He looked at me first and then at the road and then uncharacteristically for him, turned right around in the median strip back to Orlando (so to speak). We started to look for homes the next morning in Central Florida. A year later we had built a new home and moved to Orlando, and the warmth of Florida. Our flower girl dress business is fun but frantic as the wedding business tends to be. We decided that if we had to work a lot of crazy hours we may as well be nearer to the parks when we need chill time. Although our decision to move to Florida was an on the spot move, our promise to live in Orlando grew from our love of the parks. Face it, Disney just makes you feel good. Don’t get me wrong, we love Universal too (especially since they opened The Wizarding World of Harry Potter). No matter what your day has been like, your week or year – Disney gives you that special feeling that makes the blood pressure just turn back to normal. We get season passes and find ourselves there generally once a week (except in Summer, we leave that to the tourists!) We enjoy ourselves there so much that we are excited when friends visit and head straight to the parks there. Eventually, we decided to celebrate our nearly 30 years in business working together (and our wedding anniversary too) with family and friends. Where better to have a vow renewal than at our favorite “get away” place? So this year, we will be working on renovating another home and discussing our experiences working together as partners. 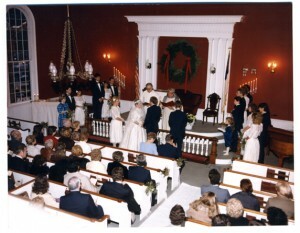 Our wedding in 1985 was wonderful but my mom and Percy Leach (God bless both of their souls) were really in charge of all the decisions. I was busy building a business with Jim and I trusted my mother’s taste explicitly. Percy was the owner/curator of Waterloo Village in Stanhope, NJ where our wedding took place, and an Interior Decorator who was used to supervising all sorts of fund raising, music and so forth at the Village of Waterloo he and his partner Lou Gualandi loved. Percy invited my father and family up there when I was just 7 years old to show the dream to him and to enlist my father (who was in politics and a law practice) to see his vision. I saw Percy’s vision right then and there and enjoyed my many years of visits to Waterloo. As a young girl, he promised me that I could get married there, only I was 7 and had to find a husband! Seeing him often, we made plans for the “wedding” without a fiance! I even called him from London during a buying trip for fabrics and laces in 1983 and told him I had found “the dress”. My family attended many concerts and events there, and even my brother proposed to his wife at the same spot. Two years later, after a whirlwind of just three dates, I took Jim on a picnic (unintentionally) and showed him this marvelous place I had fallen in love with. Right then, outside the old Methodist Church of Waterloo, he proposed, just 5 days into our relationship! Percy and I were off and running, and although not professional, he was a very good wedding planner who made our evening magical. I was building my business at the time, so much of the wedding was decided by Percy and my mother since that’s what you did 25+ years ago. I think except for the cake, I had no firm ideas and left most decisions to my father and mother because they were of similar tastes as I. From the fantastic music and food choices, I left it to them to make final decisions. This blog is dedicated to my former mentors, Mom and Percy —- and hopefully they will be watching me from above with full blessings…. both of whom not only helped me get my wedding together but both of whom shared with me their love for design and interior design. Percy was a celebrated Interior Designer to New Jersey’s famous residents as well as many other. He also had a wicked sense of humor. His love for design was carried through in one of his great loves, the restoration of Waterloo Village in Stanhope, NJ. I love them and miss them both terribly. I hope you will join us in our journey of life, love, home, and work.